Those who have controlled words have had the power to shape the world around them, and to confer, seize, or retain the social status. This book, alas, doesn't harness that power. Words are always more than just a definition in a dictionary. Words are currency. They enfranchise those who possess them with the means to articulate and describe. They spread uncontrollably, penetrating cultural boundaries and undermining the status quo. They’re fraught with power and potency well beyond the denotations and throughout history, those who have controlled words have had the power to shape the world around them, and to confer, seize, or retain the social status. Though Irish-Americans are a large and established ethnic bloc in the United States with a firm cultural and political presence in regional strongholds like Boston, Chicago, and New York City, their ancestors had to suffer through decades of marginalization and persecution to make it so. The millions of immigrant Irish, some of the first huddling masses to truly make a dent in the United States, left no evidence of an impact on the language, at least, on paper. Though they may not have persuaded any dictionary editors to say so, it’s absurd to believe that such a colorful and persistent group of people, who were so instrumental in the rise of the country, failed to pass on some of the Irish tongue. Of course they did. It’s just that they weren’t part of polite society; instead, their words were spoken in dark corners and out-of-the-way slums in the land of opportunity. 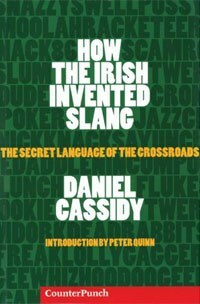 How the Irish Invented Slang: A Secret Language of the Crossroads aims to reconcile the long exile of the Irish peoples from their rightful credit as significant contributors to the New World lexicon. Cassidy is the co-founder of the Irish Studies program at the New College of California, a tiny liberal arts school, and though his bona fides seem in order, the book has a strange, casual tone that makes it hard to approach. At first glance, it purports to be a comprehensive exploration of “two hundred years worth of Anglo-American academic baloney,” yet in reality it’s a short collection of essays (only 68 pages worth) appended with a massive, difficult to parse “Dictionary of Irish-American vernacular” in which Cassidy attempts to couple familiar slang with its purported Irish antecedent. The introductory essays cover a variety of topics, from Cassidy’s own New York Irish upbringing to a look into the world of The Gangs of New York, and the proliferation of corrupted Irish words into the underworld of poverty, gambling, and crime. The narratives of these essays attempts to provide context for the sublimation of Hibernian influence, demonstrating how racial prejudice and class condescension led those who controlled words in the 19th and early 20th century to cloak the 'uncouth' Irish origins in more 'acceptable' Anglo dressings. The essay portion is peppered with boldface words, accompanied by brief parenthetical definitions, which serve as Cassidy’s main vehicle for pointing out the hidden histories of common terms: slum is s’ lom, galore is go leor, crony is comh-roghna, and so on and so on. The tactic is not well implemented. The parenthetical definitions give very little in the way of support or evidence, and Cassidy uses them multiple times on each page. They clutter up the essay’s narrative, making it hard to focus on the matter at hand. Very quickly they begin to feel like obstacles rather than enlightening bits of knowledge. Throughout the book, Cassidy relies almost exclusively on phonetic similarities between words to explain their connection. At the very start of the book, he describes stumbling across words in an Irish dictionary which seemed to leap out at him as related to common English slang or vernacular. Rarely does he indicate that he sought out further supporting information to confirm his hunches, or to exclude competing explanations for a word’s etymology. A particularly illustrative example of this problem comes in the dictionary portion of the book, in the entry for the word kabosh, or kibosh. Cassidy explains that the Oxford English Dictionary (OED) defines the word as “to kill, dispose, or finish off. Origin obscure.” The first problem arises with his citation for this definition. Yes, it comes from the OED, but Cassidy cites the Dictionary of Hiberno-English, which itself contains the reference to the OED. He himself identifies the origin of kibosh as the Gaelic caidhp bhais, which bears a phonetic resemblance to the word in question. Caidhp bhais literally means “death cap”, and refers to the poisonous death cap mushroom. Cassidy asserts that this also refers to a black cap worn by an executioner, yet provides no direct evidence. The only citation the author provides that claims an Irish origin for the word kibosh comes from “Cork Slang Online”, a source that does not appear in his bibliography, has no identifying information, and cannot be found in a general web search. The Dictionary of Irish-American Vernacular contains numerous examples of such vague and unconvincing explication. There are brief glimmers of light, especially in the essays regarding the development of the words “dude” and “jazz”, but these are lost among the wreckage. For someone who criticizes Anglo-English dictionaries so stridently, Cassidy seems to fall into a similar trap. Convinced of his thesis and eager to disseminate his ideas, he fails to vet and solidify these connections enough so the reader can feel certain about them. Words are too powerful to be anything less than certain.